At one point, the torch-wielding group of mostly white men surrounded a smaller of group of counterprotesters standing at the base of a statue of Thomas Jefferson, and a brawl broke out. Counterprotesters reported being hit with pepper spray by marchers; according to the Washington Post, one counterprotester also used a “chemical spray” against marchers. “They completely surrounded us and wouldn’t let us out,” local activist Emily Gorcenski told the Guardian. Organizers affiliated with the white nationalist alt-right called the march in advance of a larger protest scheduled for Saturday to protest the removal of a statue of Confederate General Robert E. Lee in a park in Charlottesville. The only good Nazi is a dead Nazi. We shot German Nazis on sight. The same should be true for American Nazis. Alas, that is illegal. Therefore, the next best thing is destroying the lives of those Nazis. They should lose their jobs and their homes. They must become pariahs. And given that the election of the Republican President Donald Trump was fueled by Nazism, any and all Republicans who wish not to be labeled Nazis must speak out and take action, up to and including leaving their party and voting against Republicans who either accept Nazi support or enable it through their silence and/or code words. Cassandra, I’m going to say this as gently as possible because I really don’t want to fight about it. The woman who was killed by nazis on Saturday was a leftist, a Bernie supporter, and a member of the IWW. Those who were injured were members of the Democratic Socialists of America and the ISO. The red and black flags you can see flying in pictures of counter protesters from that day are leftist, socialist, and anarchist symbols (red and black together is specifically anarcho-syndicalism). I understand that you do not share their ideology. But please rethink your use of the term “alt-left.” It’s a baseless, right-wing attack on people who are on the front lines fighting racism and being hurt and killed for it. Please do not de-legitimize their struggle. Left-wing unity goes two ways. There are people all over the country coming together to honor Heather’s memory and to make a principled stand against racist right-wing groups. I know you’re part of this movement. Please don’t attack people who could be your allies here, because regardless of what you call them they are still going to be on the same side as you in this fight. Did you mean to ask me what I meant by “alt-left” before you wanted to lecture me on it? Because I am coming around to the idea that there is a meaning to it and the folks I was angry about above fit the definition pretty well. And these folks especially — I wouldn’t bet money that they’d be an ally to much outside of their own set of resentments. I went to the Wilmington event for Ms. Heyer and Charlottesville last night. I’ve been almost paralyzed with anger almost all weekend. This single comment does not disrespect Ms. Heyer or her sacrifice. It *does* disrespect a certain set of leftist “values” where taking the opportunity to diss HRC ONE MORE TIME is more vital than taking the opportunity to value the sacrifice of Ms. Heyer and all of those who stood with her. Hillary was wrong about one thing — they won’t fit in a basket. White nationalism is morally indefensible. This is not a point that is up for discussion. If you are willing to give these people the benefit of the doubt, you are complicit in the rhetoric of racists and bigots. Playing “devil’s advocate” is unacceptable. I am not willing to listen to one more interview or read one more article about the “economic anxiety” of the American racist. If you disagree with the central premise that white nationalism is evil and morally wrong, then I have no words for you. May God have mercy on your soul. If you can identify that this is evil and wrong, ask yourself why these men (and more than a few women) are angry. Why? 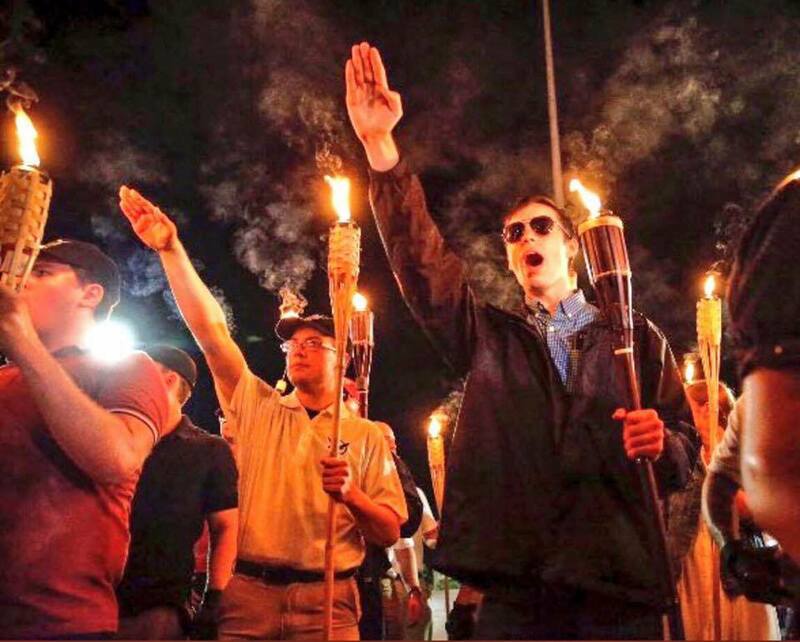 What has provoked these people to buy a bunch of Wal-Mart tiki torches and scream Nazi slogans at a Confederate statue? Imagine for just one second that these protestors were black. Let’s just say the reaction of the president would have been different, as would the respnse of law enforcement.